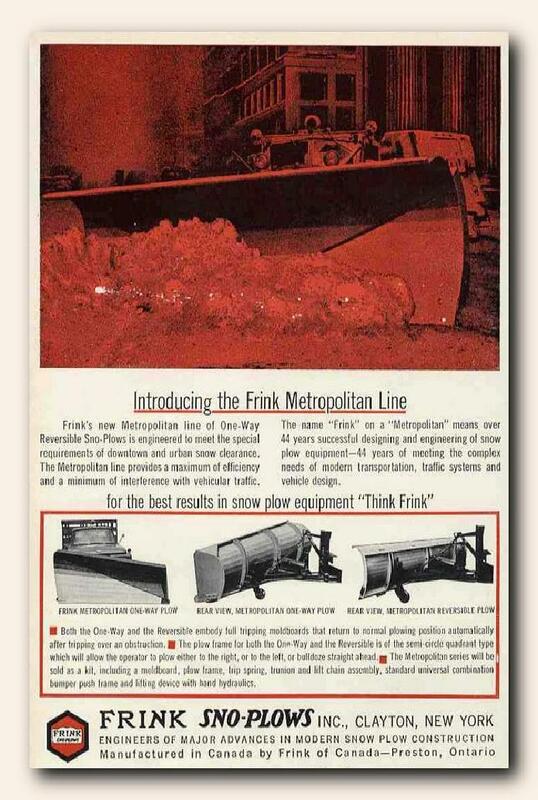 Attention all enthusiasts- We are looking to locate and save a Frink off-set veeplow such as the one pictured on the rotary plow page. Any help locating one would be greatly appreciated. FYI- I checked with the folks at Penn-Hazel Equipment and they don't have an offset vee at the yard. The search is still on, I know we can find one to save! 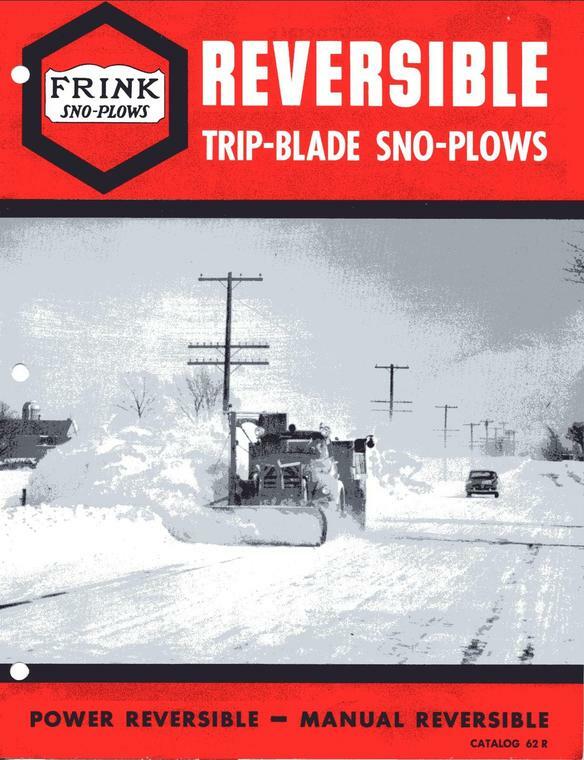 I think they started using this c. 1933-1935 as often the plow would be a different age than the vehicle it was mounted on and someone would complain that they thought they had a "old" or "secondhand" plow instead of new. 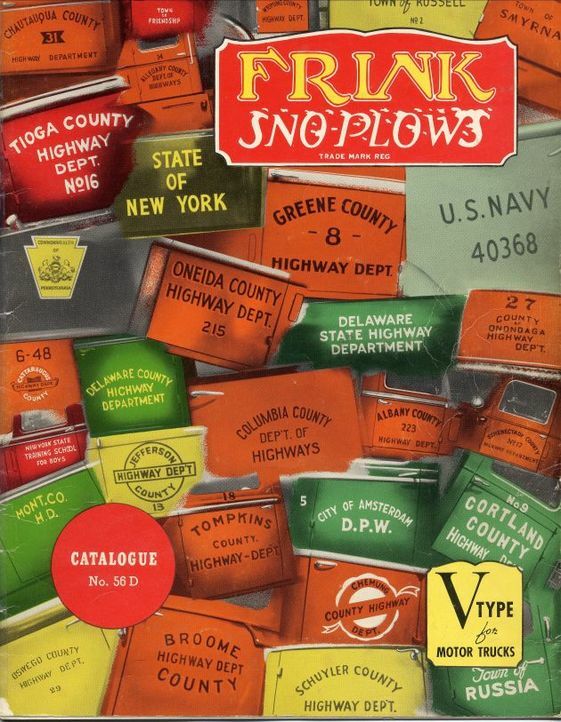 Frink had alpha-numeric serial numbers for their snowplows, beginning in the mid thirties as mentioned above. 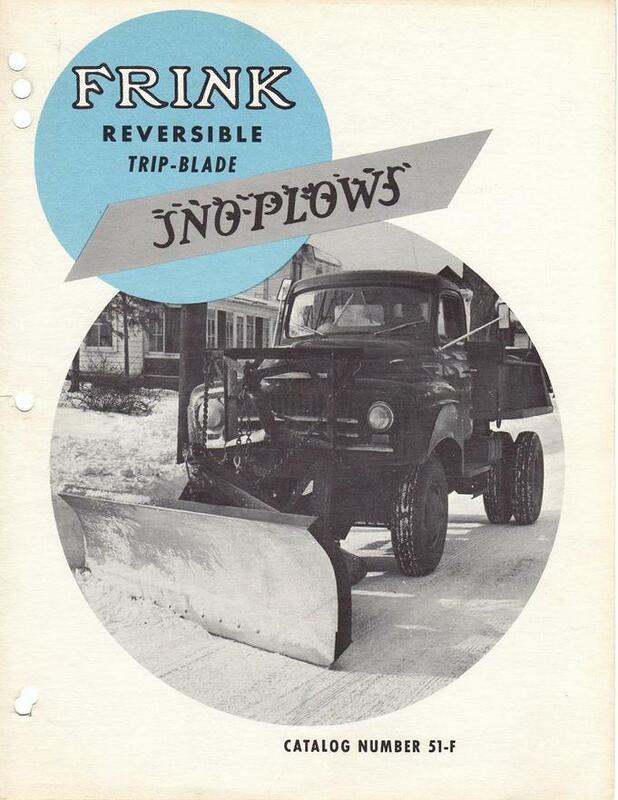 As an example, if your plow serial number is JF***** it means that it was manufactured in 1941 (following the code above). Hope this helps and thanks to anonymous for the information. 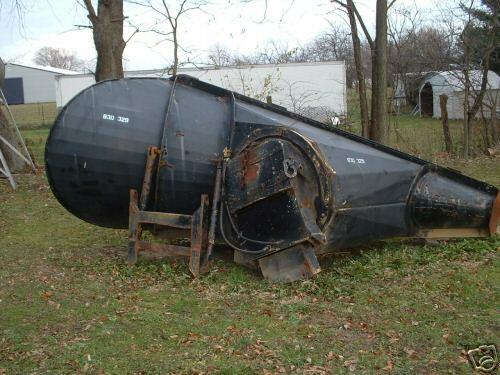 I got an email the other day from Irondinosauerhunter about a Frink Roll-Over plow for sale on eBay. Here is the short video showing what they were made for and how they worked. 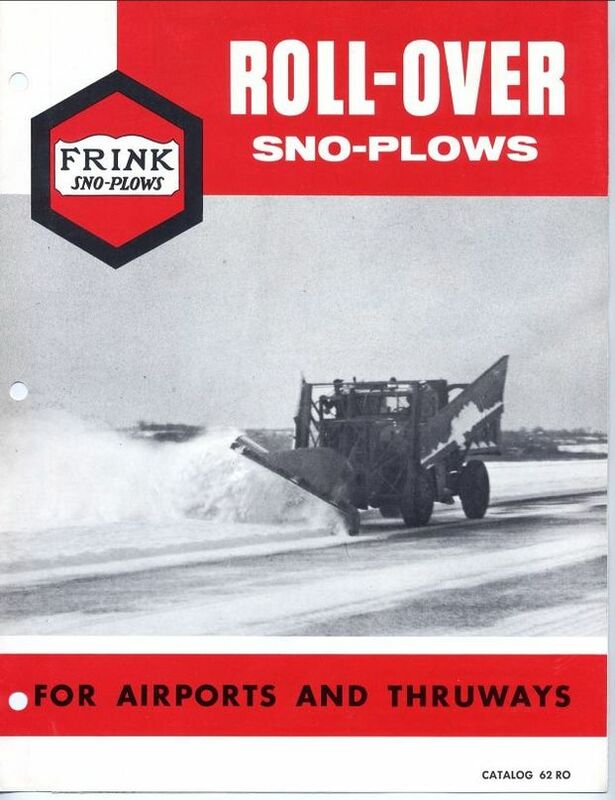 They worked well plowing airports (military bases) in that you could always plow the snow away from the runway. You'll see how quickly they could be switched from one side to the other. 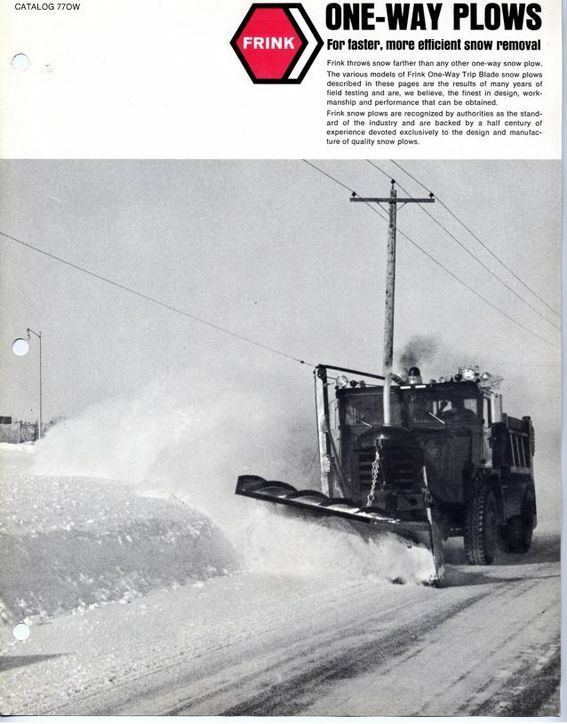 My last comment is that they do a great job throwing the snow, something that most current design reversible plows struggle with. 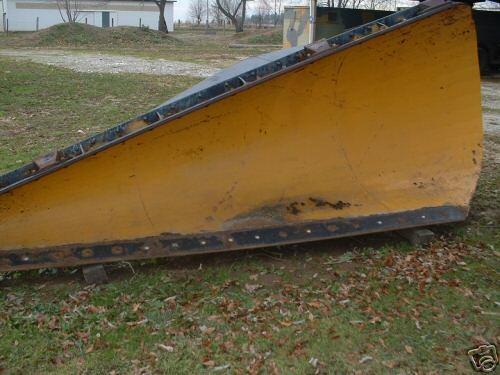 Here are two photos of the plow that was for sale on eBay. The plow did not sell, so if you are interested, it may show up again. 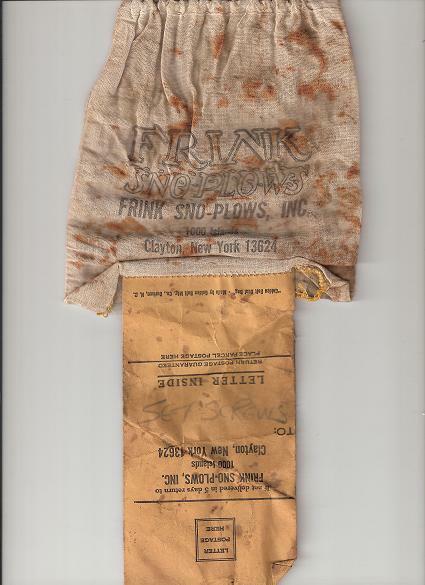 Here's one for all you Frink Sno-Plow fans- an original set screw parts bag, compliments of anonymous (ferrology). 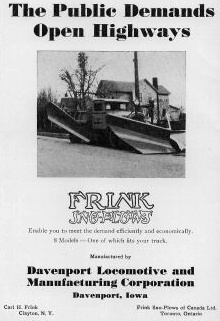 http://www.wausau-everest.com/brands/frink-america/ Was not aware of just how the dust finally settled on the Frink story, it became a sordid tale of Labor Dept. and union battles and shifting to Canada, charges of theft of intellectual property, etc. etc. Frink plows all getting scrapped - seems like lately everything that had been saved from scrapping, is getting scrapped, dumpsters right from outfits at the Port of Albany are appearing locally, bypassing the local scrapyard millionaires eveyone has gotten tired of being shorted by, (and those yards are almost empty now, crocodile tears for them). About half or more of the 2008 scrap drive survivors have gone in the st year, but many people are also just liquidating, downsizing, or simply GTF out of NY state and I can't blame them, I've been busy cleaning up metal around here myself. I think to a large degree, the generation into that sort of thing is passing on and hot rods and rat rods are all the younger generation cares for, and it's just too expensive to have too many hobby vehicles. The Frink story I can add to. 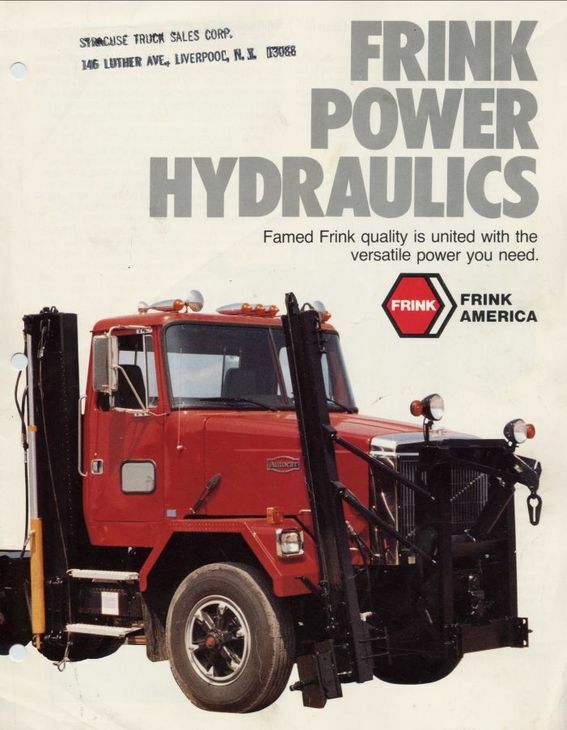 I worked for Frink back in the 80's when times were good. I worked for the Canada side, which back then was owned by old man Simpson (that was what we called him). He owned both Clayton and Canada. After he passed away there was a power struggle between his ex-wife and his much younger new wife (snow queen) as well as his son Scott. The snow queen won the battle and shut down Clayton and moved everything to Canada. After a short time of debt she then closed Canada and reopened Clayton under Frink America. 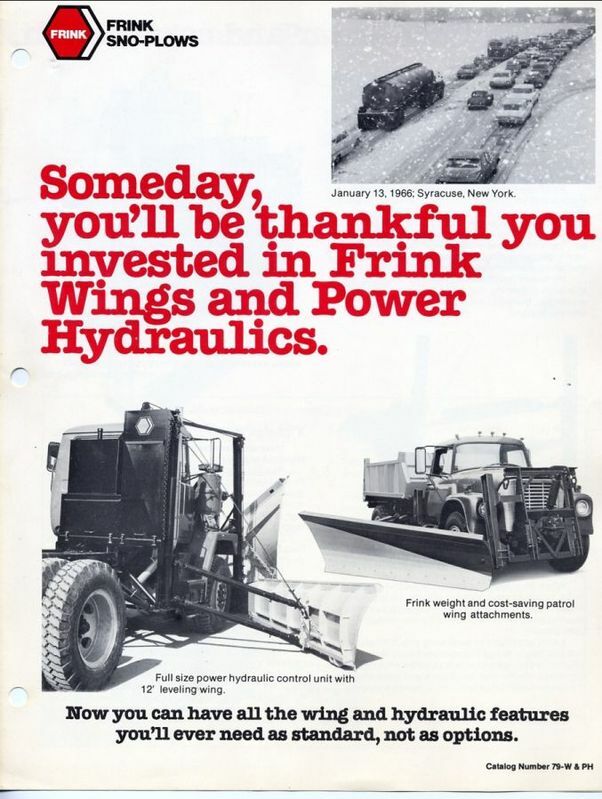 We didn't go down without a fight and we're bought by an entrepreneur as Frink Canada. He couldn't make much of a go with it and in receivership were bought by Champion Road Machinery. Soon after they closed the doors for good. And sold the rights to Viking the competition. The building stood empty for years and now is rented out in sections to other vendors. My brother inlaw has his shop set up there right where I worked (the mounting bay). Oh how I miss that job. I was so happy back then. If I could do that type of work again I would in a heart beat.